Our two point rifle sling is the essence of simplicity. 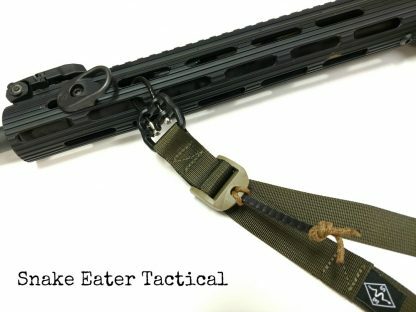 1″ nylon webbing runs through a heavy duty ITW Ladder Lock at the forward end of the carbine to allow for quick adjustments, while keeping your support hand close to the hand guard. 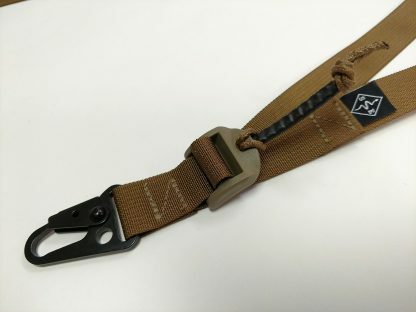 Several different mounting options are available including a heavy duty QD swivel, an HK snap hook, a Blue Force Gear wire Uloop, or a sewn webbing loop. The rear of the sling can be passed through any 1″ sling mount, or additional mounting hardware can be added. A Z fold 5″ from the end ensures you will never run the sling out completely. You will always have a 5″ tail to grab to cinch it back down. Light weight! The webbing loop version weighs only 53 grams and makes zero noise.